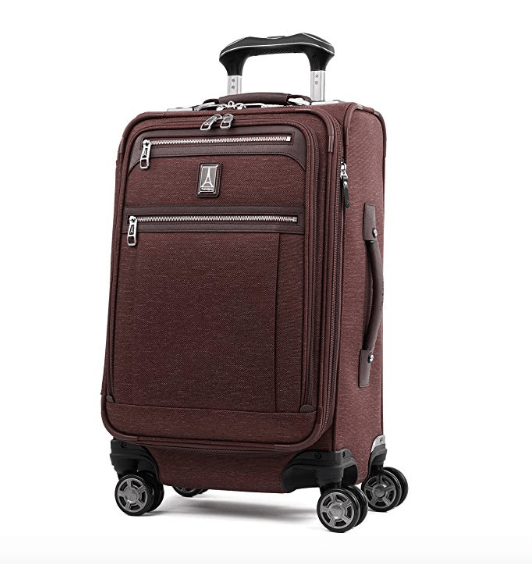 TravelPro Platinum Elite 409186109 is a 21” deluxe expandable carry-on bag with 360-degree rotating spinner wheels and an external USB port as well as a dedicated powerbank pocket. It is a fairly expensive bag with a very modern and innovative design, premium materials and genuine leather accents and user-friendly functions like the deluxe packing flexibility. You can get it in four different colors of Bordeaux 409186109, vintage grey 409186105, shadow black 409186101 and rich espresso 409186104. The first three colors have the same price tag at the moment of this review and rich espresso costs about forty dollars more. Like you’d expect from any luggage purchase online, the package will show the contents if you don’t select the “Conceal Package” option on the checkout page. It is an imported expandable spinner cabin bag that is made of very dense ballistic nylon with Duraguard coating for great protection from abrasions and stains and fabric lining inside. There is a detachable quart-size wet pocket for you to put your toiletries in and integrated accessory pockets and the deluxe tie-down system. You’ll stay connected with the airline compliant external USB port. Please note that the power bank is not included and you can put your back-up battery in the dedicated power bank pocket. It meets the FAA regulations for both the checked and carry-on baggage. This great little 21” bag offers better- effortless and precise control of the bag as part of the precision glide system, you have the magnatrac spinner wheels that rotate smoothly in all directions, an adjustable and sturdy PowerScope telescoping handle that locks at four points and a patented contour grip and rubberized touch points with an ergonomic design. It also has the leather side and top carry handles as well as the bottom cup to give you lifting options. You can pack and keep your suits and other clothes free of wrinkles thanks to the drop-in and fold-out suiter. The lock is TSA-compliant as you would expect from a high end bag and the TSA staff at the airport will check the contents of your luggage when needed, without having to damage the lock. After you register under the trusted companion promise you will be covered for the damage by the airlines or other common carriers for the life of the product. 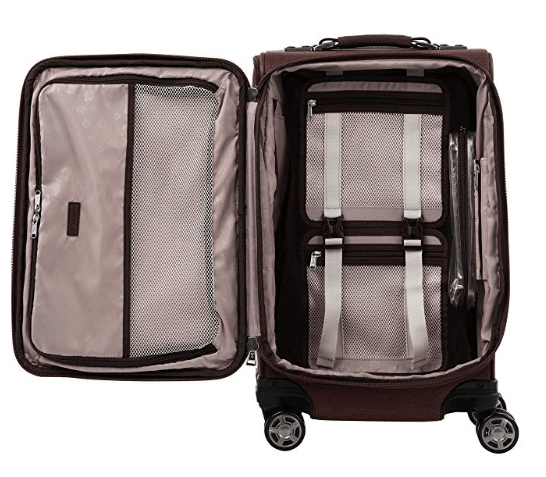 TravelPro Platinum Elite 21″ Cabin Bag weighs 7.8 pounds and measures 21 x 14 x 9 inches, meets most of the domestic and overseas carriers’ cabin luggage size restrictions as it was sizer bin tested at its development stage. It is spacious inside and offers tip-resistant expansion for up to two inches more space. Like the all TravelPro bags we know the Platinum Elite is very functional and built very sturdy and will look good and prove durable after many years of use. It is sophisticated and elegant without compromising on strength and durability.